Like all good projects, ethical hacking too has a set of distinct phases. It helps hackers to make a structured ethical hacking attack. Different security training manuals explain the process of ethical hacking in different ways, but for me as a Certified Ethical Hacker, the entire process can be categorized into the following six phases. 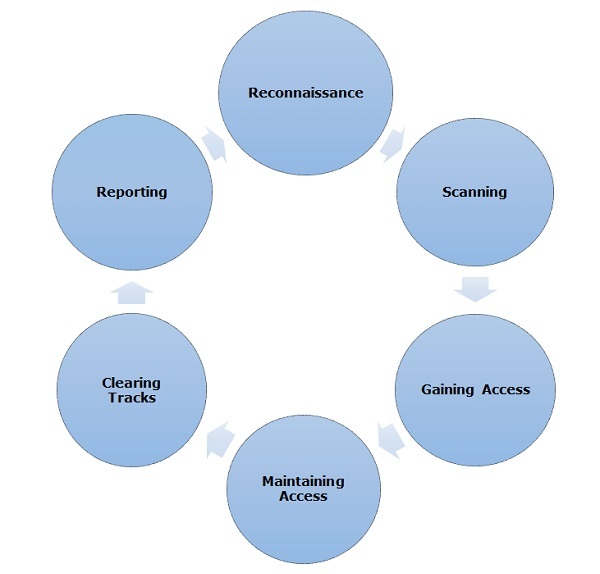 Reconnaissance is the phase where the attacker gathers information about a target using active or passive means. The tools that are widely used in this process are NMAP, Hping, Maltego, and Google Dorks. In this process, the attacker begins to actively probe a target machine or network for vulnerabilities that can be exploited. The tools used in this process are Nessus, Nexpose, and NMAP. In this process, the vulnerability is located and you attempt to exploit it in order to enter into the system. The primary tool that is used in this process is Metasploit. It is the process where the hacker has already gained access into a system. After gaining access, the hacker installs some backdoors in order to enter into the system when he needs access in this owned system in future. Metasploit is the preferred tool in this process. This process is actually an unethical activity. It has to do with the deletion of logs of all the activities that take place during the hacking process. Reporting is the last step of finishing the ethical hacking process. Here the Ethical Hacker compiles a report with his findings and the job that was done such as the tools used, the success rate, vulnerabilities found, and the exploit processes. The processes are not standard. You can adopt a set of different processes and tools according to your techniques that you are comfortable with. The process is of least significance as long as you are able to get the desired results.